Graves Motorsports LINK™ Header System for the 2018 Yamaha FZ10 / 2018-2019 MT10. LINK ™ Exhaust components are designed for the elite rider seeking top of the line performance, fit, finish and value. 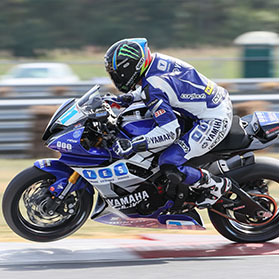 This FZ10 exhaust system was developed using the same technology that has powered Monster Energy Graves Yamaha riders to 7 straight consecutive Moto America / AMA Superbike championships along with numerous 600cc titles. This product is intended for closed course competition use only. Use of this product for any other purpose is strictly prohibited. Combined with Graves’ exclusive flash tune map this system produces huge mid-range and top horsepower gains. This tune also removes any computer error codes the bike will have when installing performance exhausts. This part features the LINK ™ header component option for your FZ10. Specifically built with the riders’ needs in mind this setup allow you to start with the combination that makes the most sense for you as a rider and your budget (along with conforming to regulations for your type of riding). You can purchase the cat eliminator exhaust separately at any time to complete your LINK ™ performance package.